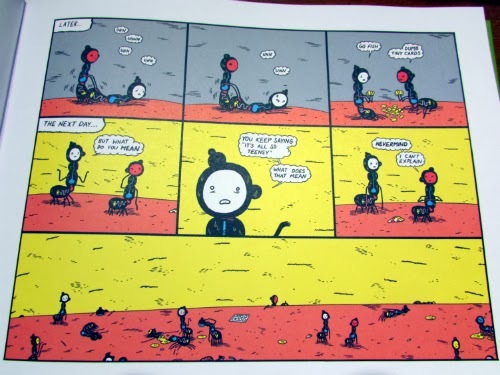 211 Bernard: Out today: Ant Colony by Michael Deforge! Out today: Ant Colony by Michael Deforge! 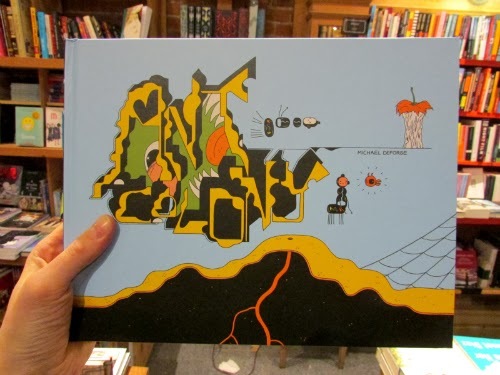 We are ECSTATIC to announce that D&Q newest release, Michael Deforge's incredible Ant Colony, is on sale today! Deforge's books - like Very Casual, which won the 2013 Ignatz Award for "Outstanding Anthology or Collection" as well as the award for Outstanding Artist - have long been favourites at the store, so we're thrilled that D&Q is publishing what we think is his magnum opus. 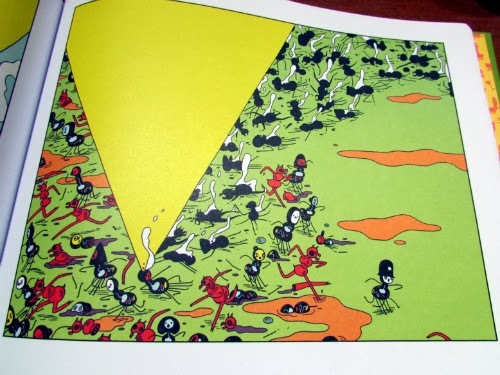 Ant Colony has been serially published online, but now you can get it in lavish hardcover. It's a dark story, but the perfect venue for all of Deforge's talents. If you've noticed his work as a designer for Adventure Time, then you already know he's got a gift for deliriously weird characters and borderline-abstract treatments of clothing and bodies. Many of his stories turn around the queasily real consequences of cartoonish flesh transformation -- the phrase "body horror" gets thrown around a lot, but Deforge brings cuteness and humour into the mix in a way that's so much more complicated than just gore and weirdness for its own sake. In Ant Colony, the all-too-human black ant protagonists struggle with mundane existental dilemmas...some of them moreso than others. "You keep saying 'It's all so teensy,'" one ant says to his more-sensitive partner. "What does that mean?" Critics have already lined up to lavish praise on Ant Colony. Here's a quote from The Comics Journal: "The queen of the colony is a behemoth, a tangle of canals and orifices before which the males of the colony queue up and into which they enter three by three to deposit their ejaculate — an EPCOT Center attraction designed by Salvador Dalí at his most trollish." Chris Randle at Hazlitt also published a lengthy and thoughtful review: "DeForge visualizes spiders as wolfish cartoon dog heads perched atop eight black sabres, a single hidden eye staring from their mouths—Carl Barks adapting Bataille." 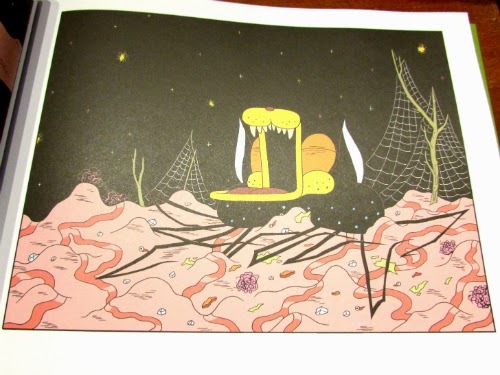 From Ant Colony's opening pages, DeForge immerses the reader in a world of false prophets, unjust wars, and corrupt police officers. On the surface, he tells the story of a war between black and red ants, the destruction of a civilization, and the ants’ all-too-familiar desire to rebuild. Underneath, though, Ant Colony plumbs the deepest human concerns – loneliness, faith, love, apathy, and more. "After the aforementioned sunlight bears down on warring ants like some towering abstracted sword, their charred corpses lie over smooth lawny green, a bucolic necropolis." Whether it's body horror or not, Ant Colony is definitely a kind of a horror story, albeit a blackly-comic one with epic scope and liberal dashes of psychedelic visions. But all the pretty colours and madly imaginative draftsmanship don't dilute Ant Colony's bad-trip bleakness. One by one, the story's most altruistic and idealistic characters succumb to massacre, depression, suicide, and insanity while the least scrupulous live to fight another day. It's a heavy tale, but if you've got a strong stomach, prepare to be wowed and dazzled. 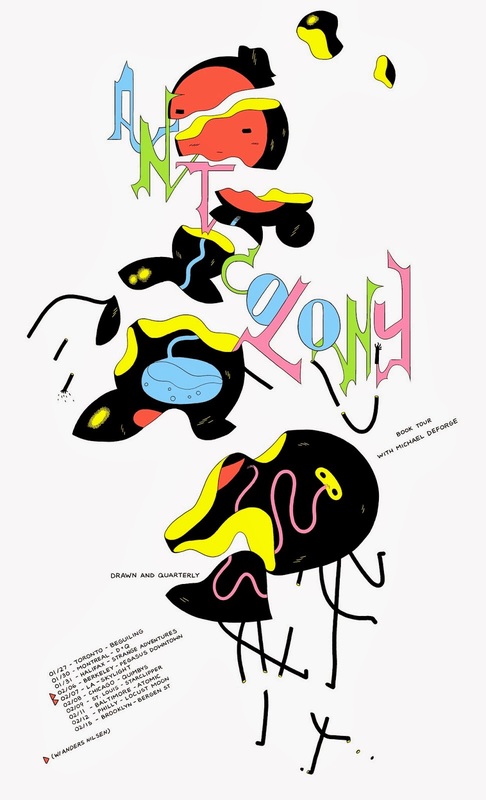 Don't forget that Michael Deforge will be at the store in person on January 30th to launch Ant Colony! Join us for what's sure to be a great night! More details here.